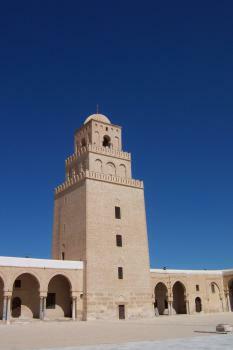 Kairouan is one of the holy cities of Islam. Its Great Mosque is also considered an architectural masterpiece, which has influenced the style of other mosques in the Maghreb. 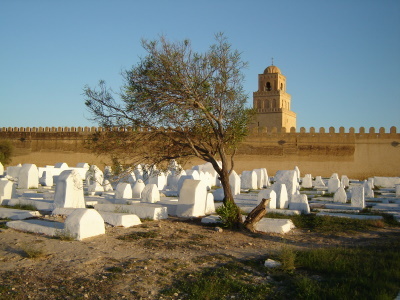 It has been said that seven pilgrimages to the Great Mosque of Kairouan is considered the equivalent of one pilgrimage to Mecca. Today, many consider the city as the fourth holiest in Islam. Kairouan was founded in ca. 670 as a post in the Arab conquest of the west. Its heyday came with the Aghlabid dynasty that ruled between 800 and 909. The Aghlabids built the great mosque and established in it a university that was a centre of education both in Islamic thought and in the secular sciences. Other notable monuments of that period include the Mosque of the Threed Doors and the Basin of the Aghlabids. I might have caught Kairouan on a bad day. I went on a Friday and everything was closed. The town was mostly deserted and I had no idea what to do, so I went with a guy offering me a guided tour. This proofed to be more interesting, than walking on my own and was a rather pleasant experience, apart from the last stop with the obligatory carpet shop (I specifically negotiated not to visit before starting the tour). With most shops and restaurants closed and almost no people, it felt rather weird to wander around the streets. I would also not be able to see the outstanding value of this town, compared to other medinas in the country I saw. I’d say it’s one of these places that due to proximity to the other WHS is a must for the real hunters, but can easily be skipped if you only go for the country’s highlights. The town can be reached rather easy by car. Expect some narrow roads on the way if you come from the coast. I did it on an easy half day trip from Port El Kantaoui, spending the rest of the day at the beach. You could easily combine the day trip with Sousse and/or el Jem, if you have limited time resources. 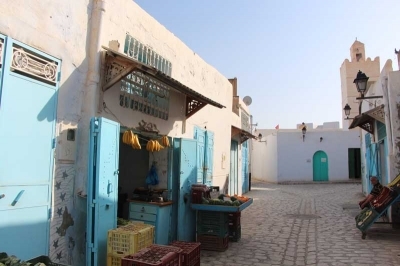 Since it is practically impossible for Westerners to visit the holy sites of Islam in Saudi Arabia, Kairouan is the closest most people can get to an introduction to the history of one of the world's major religions. Kairouan is easy to visit from the tourist regions of the coast and certainly makes for a worthwhile trip, if only to see the really impressive Great Mosque. Kairouan is the fourth holiest city in Islam, (although I have just done a little research and this may be a tad controversial!) and it is said that travelling there 7 times is the equivalent of travelling to Mecca. The most impressive site is the great Mosque with its powerful if austere minaret and columns taken from Carthage! Also impressive is the facade of the Mosque of Three Doors! Near the medina entrance is the mosque containing the well that the city was founded around which is supposedly linked to the Zamzam well in Mecca and is a site of Pilgrimage, I found it a bit odd as there was a blinkered camel turning the well in a very small space, but there are some amusing pictures of the camel going up and down the stairs that reach the site. Kairouan is easy to get to from Sousse, either by bus or Louagge which I would recommend more as on the bus we got picked up by a tout for one of Kairouan's many famous Carpet shops before we even arrived, and it is best to get picked up by one outside the great Mosque as their views are much better, and they will tell you their carpets are better too!!! 121 Community Members have visited.